Quick overview The world's greatest contrarian confronts his own death in this brave and unforgettable book. During the American book tour for his memoir, Hitch-22, Christopher Hitchens collapsed in his hotel room with excruciating pain in his chest. As he would later write in the first of a series of deeply moving Vanity Fair pieces, he was being deported 'from the country of the well across the stark frontier that marks off the land of malady.' Over the next year he experienced the full force of modern cancer treatment. 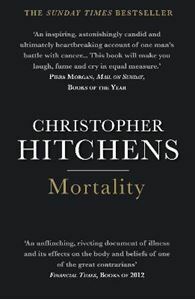 Mortality is at once an unsparingly honest account of the ravages of his disease, an examination of cancer etiquette, and the coda to a lifetime of fierce debate and peerless prose. In this moving personal account of illness, Hitchens confronts his own death - and he is combative and dignified, eloquent and witty to the very last.